This issue of Sub-Mariner not only holds the distinction of being the first issue of the character's title that I'd read, but also the very first Marvel comic book that I ever picked up. I couldn't point you to any one reason why; I suppose I was just struck by the nobility of the character, drawn and inked so beautifully on the cover by Marie and John Severin. The image remains the definitive Sub-Mariner for me. As it happened, I'd also lucked into picking up an issue that gave an excellent retelling of Namor's origin. I admittedly don't have a very high opinion of artist Ross Andru's artwork--but I must give credit where credit is due, as the interior art excellently details an Atlantis in its nascent stages of development. I lot of the credit, in my opinion, goes to inker John Severin, whose work here and in issues of Incredible Hulk and other titles results in a splendid finished product. Namor's origin is told by himself, in his musings following the death of his bride-to-be, the lady Dorma, who was murdered by an old enemy whom Namor had spurned. And page one does a splendid job of ushering us in to Namor's current state of mind, as he mourns both Dorma and his impending wedding to her that will now never happen. 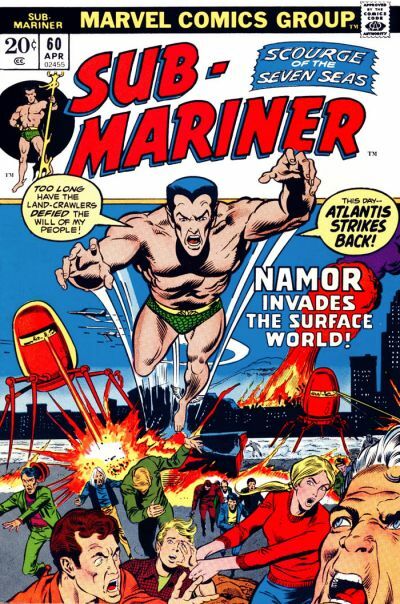 As many readers know, Namor's origin comes about as a result of the violent (and misunderstood) incursion of surface dwellers at the site of Atlantis' ancestral home underneath the Antarctic ice. His thoughts drift back to those times as he visits Dorma lying in state. 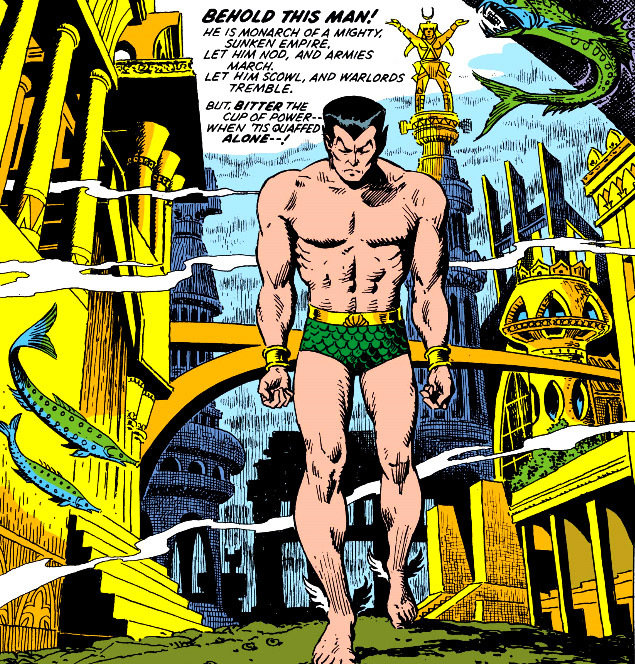 The entire recounting of Namor's origin is meant to set the stage for a dramatic event later in the issue, though it's certainly an odd time for him to reminisce on the history of his species. The reason given--that Dorma's death was caused by the daughter of a human, which makes Namor think how wise his ancestors were to abandon the madness of land-dwellers for the sea--is such an odd reach, given that one generally doesn't dwell on historical matters when one is in mourning. Nor are ocean-dwellers exactly free from initiating conflict amongst themselves. If Namor is simply grasping at straws in order to reconcile his conflicting feelings in the wake of Dorma's death, it seems a very unusual tangent for him to divert to. On the other hand, up to this point we've seen just bits and pieces of Namor's origin, which is now presented in more detail than ever before--and in Namor's own words, no less. So from a reader's perspective, the diversion is rather interesting, with Namor's tone during the retelling tinged with the sadness and regret he seeks to resolve. 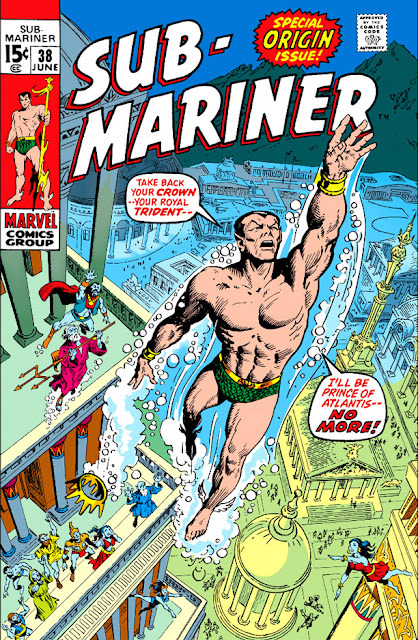 There were once descriptions of Namor in other books that were pushing for Namor to be labeled Marvel's first mutant, though I never really bought into that. 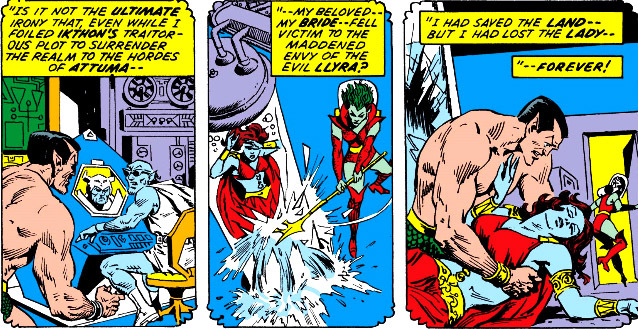 Unless Leonard McKenzie or Princess Fen was working with radioactive isotopes or was otherwise exposed in some way, I don't see how the word "mutation" would apply to Namor, ankle wings aside. (Though it's possible a previous ancestor of either parent was thus affected.) Perhaps "hybrid," a description which has been occasionally used with Namor before, would be a better word. At any rate, Namor's thoughts on his origins also cover some other fascinating ground--his first exposure to (and confrontation with) humans, his fond associations with both Betty Dean and Sue Storm, and of course his growing relationship with Dorma. 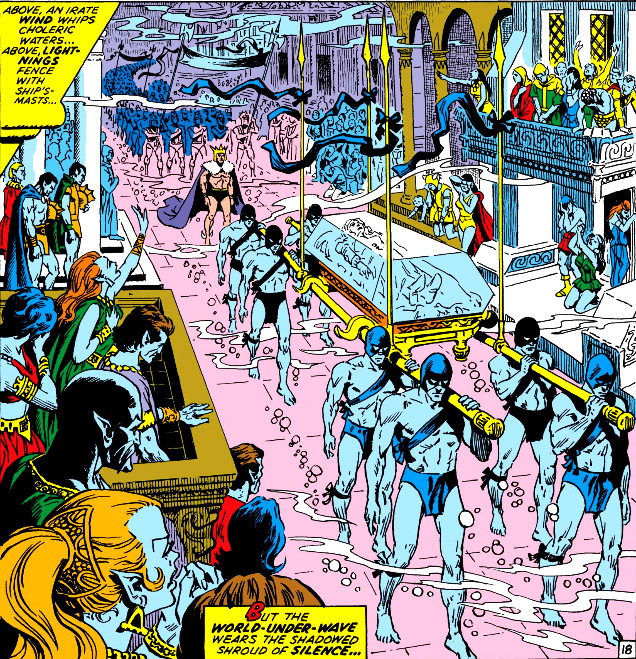 Which brings us full circle to a solemn event, and the end of Namor's self-reflections. Addressing the populace, Namor stuns the crowds by immediately (and unexpectedly) addressing the topic of Atlantis' long period of strife with the surface world, as well as assigning blame for it. And on its heels, he makes an announcement that takes everyone completely by surprise. Not exactly what a nation in mourning expects to hear from its leader. I'm sure more than a few people were wondering where the hell all this was coming from, and what in the world did it have to do with Dorma's death. In his origin retelling, it was certainly clear that it was Namor who did indeed threaten the surface world with hostilities--though to Namor, it was probably a show of strength which he felt needed to be put out there. But aside from the odd timing of making that admission publicly in the wake of Dorma's entombing, why would that warrant not only abdicating his throne but also abandoning it on the spot? No discussion with his cabinet or advisors, or at least Vashti? No arrangement for a smooth transition--just yank the rug out from under your people and swim off, leaving them to fend for themselves with no formal ruling succession in place? You can almost hear the neighboring undersea kingdoms and warlords sharpening their spears. 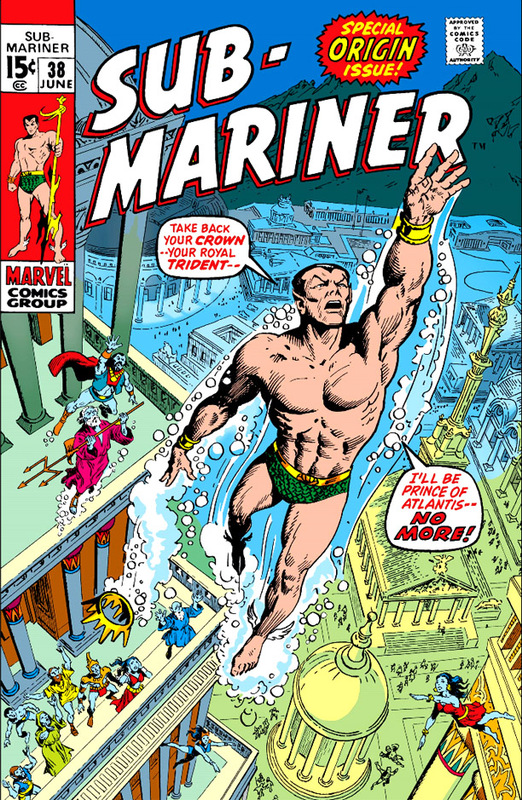 As a dramatic moment, it certainly capped the issue; production-wise, it made way for a new direction for Namor as he immediately heads to the surface world to make a home for himself. (Of all places. Didn't he just get finished poo-pooing land dwellers and telling us the surface world was a place to be avoided?) And despite the issue's letters page announcing that Ross Andru would be replacing Sal Buscema on artwork from that point on, Gene Colan takes over just a couple of issues later, with Gerry Conway replacing scripter Roy Thomas. It almost makes it sound like this new direction wasn't entirely thought through. From that point, it was a downward spiral for both Namor and Atlantis--with the city later smashed to ruins, its people near death from exposure to nerve gas, and Namor forced to wear a life-sustaining costume, before cancellation of the book took place just a few issues afterward. The only bright point was prior to this period, with the return of writer/artist Bill Everett for a little over a half-dozen issues. Yet in the end, Namor turning his back on his kingdom eventually reminded us of the adage that you can't go home again. I wonder how loose Andru's pencils were, cuz that art looks pretty much all Severin.